Come and discover Blank & Jones' weak point. I'm a fan of the general work of Blank & Jones. Not like a super gigantico fan of any sorts -- I wouldn't dare tattoo their logo on parts of me that should remain unseen and un-thought-of -- but they've certainly created some memorable tunes. In fact, some of my earlier forays into the more danceable music scene came by way of Blank & Jones' classic track, "The Nightfly". So every time that a new Blank & Jones single comes out, I like to lend a free ear, just to see what those fellows have been up to in their studio. And every time that I do so, I am often surprised by what they have to offer. Usually, it's a very pleasant experience. That's not quite the case this time. This is "Catch", basically a cover version of Kosheen's song of the same name from way back in 2000. Now, on the surface, the Radio/Video Mix seems like a very full-sounding trance tune. But you really have to examine this track in order to get any sense of what hand you're really being dealt here. This doesn't really sound too much like the Blank & Jones I've known for the past few years (and if I didn't know it was them producing this single, I'd have not guessed it at all). There doesn't seem to be much of a specific hook to this song, only because there isn't much variety within this song. It's just the same plucky arpeggiation in the background, looped over and over, with very little variation except in the amount of bass they decide to interpolate and flow in and out. And that plucky 'melody' is really just a rip from the original -- nothing special has been added to indicate that Blank & Jones put much thought into remaking this song. Furthermore, the vocal stylings of Elles de Graaf are rather flat and relatively lifeless compared to her previous works (with both B&J, as well as in other past productions). She's really trying to sound like the original singer from Kosheen, but it just doesn't cut the mustard. Overall, the radio/video version leaves much to be desired; it's a pretty substandard B&J track that could have been so much better. In fact, had they just continued down the path they were already traveling down (with no cover versions at all), they'd probably have had a real doozy of a single. Still, this song is getting plenty of airplay, so someone must like it. The Progressive Mix is actually a lot better and more creative overall, as it doesn't just blatantly yank elements from the original "Catch"; it plays with them though. This, too, doesn't sound like Blank & Jones very much, but it's still closer to their more recently-acquired sound style. I guess those fellows are more interested in change and flexibility. This mix plays with some deep, slightly squelchy but rich bass, as well as some more trance-laden angelic pads that do the trick better than the radio version. The producers also fiddle around with the vocals, often omitting certain parts of the verses (including within the chorus), creating a more instrumentally-focused composition. It's better than the radio version. The Martin Roth remix of "Catch" immediately sounds much richer with a deep reverbing bass and a very heavy, slightly industrial sound to it. Besides from a strong bassline, there's nothing that really stands out about this track, it has a different backing melody than the original, which adds some spice to the mix. Vocal effects just build upon the overall mood of the mix. This is just what the song needed, making "Catch" just a little more listenable. It's not the greatest remix in the world, but this may just be the highlight of the single. The fellows of Blank & Jones have also provided the Mac Zimms remix of their previous single, "Revealed". I didn't think the original version was particularly powerful (it was more of a relaxed tune), but Mac Zimms has placed his hand upon the song in an attempt to make it funky. Unfortunately, what we get is relative rubbish. Chopped and cheesy synths abound this, matched with a boring repetitive bassline that just lead to any particular climax. It's difficult to tell that this is a remix of "Revealed"; the vocal elements are missing, and the main melody is...nowhere to be found in this cluttered pile. Horrid stuff. The video for "Catch" is also on this disc. It's not a thrilling video by any account. Just expect a cute girl with partially blurred vision to think she's being stalked while running around aimlessly on a seemingly never-ending circular staircase. Splice in a few shots of the guys from Blank & Jones looking like they're planning to shoot her in the leg (while sequencing music on their laptops), and you have yourself a music video. Oh yeah, then the girl finds a door and starts pounding on it and kicking it, but Blank & Jones on the other side don't seem to feel like doing too much about it. The video starts getting weird when she leaves her stuff on a stair, then runs downstairs, only to find her stuff on a stair... it IS an endless staircase! Whoa! Eventually she finds her way to the front door, and leaves... only to find herself exiting the door from upstairs again! Damn, are you confused? So am I. Looks like that girl's going to need to hack her way out with an axe. Interesting idea for the video, not very exciting. Too much brown. So there you have it. With this single, you have to take the good with the bad. Unfortunately, it is the radio version that is supposed to grab your attention, so if you don't like that, don't get this. 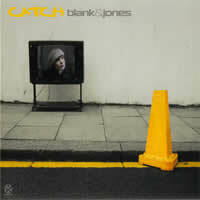 I can only recommend "Catch" to true Blank & Jones fans, or fans of the original, or even just fans of music videos featuring a confused cute girl. Hmmm... I seem to like the Ferry Corsten remix of the original version by Kosheen a lot better than this. Still, it's a sub-par effort on B&J's part. Come on, guys -- you can do better. Don't go trying another cover song!